A unique species of early cretaceous snake â unique in that it apparently had four functioning limbs â has been discovered in the BÃ¼rgermeister MÃ¼ller Museum in Solnhofen, Germany this month. The discovery was made by Dr. David Martill of the University of Portsmouth, who was showing a group of students through the museumâs collection when he noticed the specimenâs remarkable attributes. The snake, which measured about 15 centimetres from nose to tail, is thought to have been a carnivore (a fact borne out by the bones of smaller animals preserved in its stomach) and probably hunted via constriction, like many of todayâs snakes. Experts believe that it may even have used its limbs to aid in the process. Built for burrowing (an activity which likely would not have included its limbs in any significant way), this new discovery lends credence to the scientists who argue for snake evolution occurring on land, as opposed to in the sea. 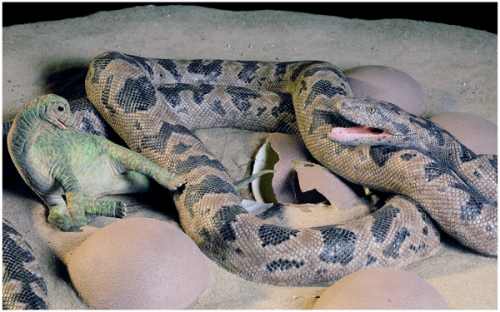 Fossil snakes with stunted hind limbs are known to palaeontologists â and even todayâs boas and pythons have a small pair of spurs where their hind limbs are thought to have once been. However, no snake, extinct or extant, has ever been discovered with four limbs. Appropriately enough, Dr. Martill named the creature Tetrapodophis, meaning âfour-legged snakeâ. However, some experts are not convinced. In our vibrant, ecologically diverse world, there are a great many species of legless lizards that are not true snakes. European slow worms, for example, are snake-like in aspect, but they are lizards, not snakes. Another example would be the Mexican Bipedidae family, which are serpentine in appearance, but which retain a pair of fully functioning forelimbs. âIs it even a snake? I honestly donât think so,â said the University of Albertaâs Dr. Michael Caldwell, an expert in snake evolution, to National Geographic.comâs Ed Yong. According to Caldwell and a growing number of other critics, Tetrapodophis lacks certain distinctive features in the spine and the skull that would label it a snake. The fact that this is the only known specimen in the world and that the skull is only partially preserved will probably see the debate continue until such time as a complete specimen is unearthed. But Dr. Martill is insistent that his discovery is a snake. Speaking to National Geographic, he pointed out the specimenâs backwards-pointing teeth, single row of belly scales, the connections between the vertebrae and the shortness of the animalâs tail after the hip â all of which suggest snake to the educated observer. Of course, many legless lizards also feature these traits, but none has all of them. This means that even if the animal has been mis-identified, it is still totally unique to science. Even more mysterious are the origins of the fossil itself, which contains the rather distinctive characteristics indicative of the Crato formation in Brazil. Discounting for a second that this is quite possibly the earliest fossil snake known to have emerged from South America, question marks have been raised regarding how the specimen could have made it to Germany when the trade of such artefacts is illegal under Brazilian law. Since 1942, it has been illegal for any unlicensed person to dig for fossils in Brazil without first gaining permission from the Brazilian National Department of Mineral Production (DNPM). Last year, a number of people were prosecuted (where they faced a maximum sentence of 20 years in prison) for the illegal export of Brazilian fossils to museums in Germany and Great Britain. Odds are that Brazilian authorities, as well as the scientific community in general, will be looking into the origins of such an important find with great interest.